Courtesy Photo Rev. Dr. David Wendel, left, performed the installation of Pastor Patrick Kelly to St. John’s Lutheran Church, North Woodbury. 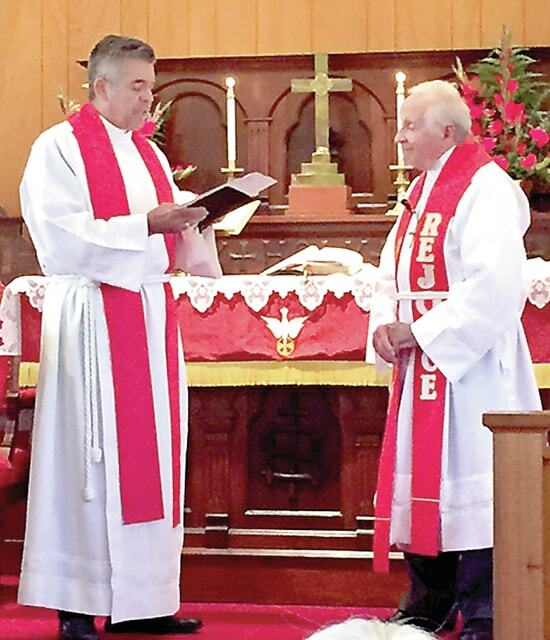 On Sunday, June 7th, Pastor Patrick Kelly was installed as Pastor of St. John’s Lutheran Church, North Woodbury, Ohio. The Installation Service was conducted by Rev. Dr. David Wendel of Hilliard. He is the North American Lutheran Church Assistant to the Bishop for Ministry. The Worship Service included Holy Communion, a Children’s Sermon by Pastor Kelly and the Sermon by Pastor Wendel. The service was well attended by church members and several of the Kelly family. Family members attending were Shirley, wife of Pastor Kelly, son David, daughter Karen Webb and son John and his wife Donna. Following the service all members and visitors enjoyed fellowship at a carry-in dinner.